THE stage is set for a bruising turf war between Zanu PF leader Emmerson Mnangagwa (pictured) and his ambitious deputy Constantino Chiwenga at the ruling party’s annual conference to be held in Esigodini, Matabeleland South province, next month, as their rival camps sharpen daggers ahead of the high-stakes showdown. Mnangagwa and Chiwenga are locked in a battle to control the party and the state, a year after the two protagonists joined forces to topple former president Robert Mugabe. In recent years, the Zanu PF annual conferences became platforms for factional fights among party leaders. Despite their public posturing meant to paint a picture of unity and harmony, Mnangagwa and Chiwenga have been fighting each other behind the scenes, including through proxies. One of the manifestations of that has been the ongoing battle to control the state media platforms, critical platforms for the control of the narrative and information dissemination. A tug of war has erupted between Information Minister Monica Mutsvangwa as well as permanent secretary Nick Mangwana, on one hand, and deputy minister Energy Mutodi on the other, over the removal of current Zimpapers editors and appointment of new ones. The ongoing clashes are fuelled by personal, policy and political differences among the players involved. The fight between Mnangagwa and Chiwenga is also playing out among war veterans amid an attempt to boot Mutsvangwa out the association. Mutsvangwa is in Mnangagwa’s faction. According to senior Zanu PF officials who spoke to the Zimbabwe Independent this week, the Esigodini conference is likely to be an explosive affair, especially in light of recent thinly veiled verbal exchanges between Mnangagwa and Chiwenga. Chiwenga, who was the face of the military coup which ousted former president Robert Mugabe last year, harbours presidential ambitions and wants Mnangagwa to relinquish the post in 2023 to pave way for his ascendancy. Mnangagwa has, however, moved to consolidate his power base by, among other actions, removing Chiwenga from the Defence ministry and his backers from government, leaving him exposed and vulnerable. Chiwenga’s allies are particularly peeved by Mnangagwa’s backers who recently launched a new slogan “#ED2023 pfee”, which is a clear indication that they want him to run for another term. The slogan was launched at a Zanu PF Youth League conference held in Harare late last month. “This has caused great friction in the party and considering that plenary discussions at the congress will debate issues around the state of the party, it could really be interesting because the other side is not taking it lying down,” one source said. Party insiders also said Chiwenga’s supporters were getting increasingly concerned that Mnangagwa was moving to limit Chiwenga’s influence in Zanu PF and the government. “In the first place, Mnangagwa realised that he was brought into power at the back of the coup which Chiwenga led and he therefore owed him some respect that is why he gave him too much room to exercise authority in the period before elections. But since then, things have drastically changed for him,” an official said. “Also in respect of that, there appeared to have been a solid understanding between the two when they ganged up against Mugabe but it is turning out that what bound them then was a common adversary in the form of the former president and his wife. You will remember that from 2015, Mugabe had started to criticise the army generals, warning them that they should stop interfering in political activities. “He clearly pronounced this at the Victoria Falls conference in December of that year. It was well-known and thus it is now clear that Chiwenga had his own ambitions as much as Mnangagwa had his own. They came together because they had a common agenda to remove Mugabe. “When it came to the actual removal, Chiwenga played a key role as he controlled the instruments of state coercion. He could however not take the presidency himself because there was a need to bring in a civilian face for legitimacy purposes and that’s where Mnangagwa was useful,” the source said. Chiwenga made his mind publicly known during a meeting with senior party members at his home in Hwedza where he subtly warned he would not allow people to personalise the party and the state, warning that doing so was very dangerous. Mnangagwa took advantage of officiating at the Zanu PF youth conference to, also subtly, hit back saying he knew of some leaders who were gathering people around and saying things that are not acceptable. He warned the party would not hesitate to discipline or expel such people. 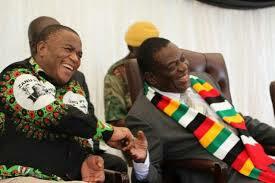 However, Zanu PF spokesperson Simon Khaya Moyo denied rifts in the party.